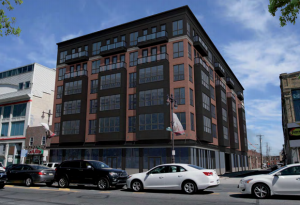 A new apartment building is planned for South Broad Street, below Washington Avenue. This new building would be taller than other buildings on that stretch of Broad Street, in South Philadelphia. It would be just south of two very large developments at Broad Street and Washington Avenue, and is replacing a garage and a vacant lot. 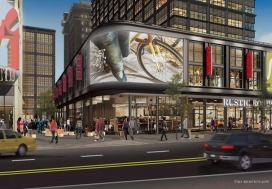 The building planned will be six stories and 72 feet tall, somewhat taller than most other buildings along Broad Street in South Philadelphia. The site and block are now zoned CMX3, which allows for buildings of that height. It is located at the intersection of Broad and Alter Streets, at 1111 South Broad Street. It would have 50 rental apartment units and 1,900 square feet of retail space on the first floor along Broad Street. The developers would like to have a restaurant or café and are considering having outdoor seating and an awning out front. There would, also, be three loft townhouses on Alter Street. Imbetween the retail space and the loft townhouses would be a parking section, with thirteen spaces. The building will have eighteen spaces for bike parking and bike racks outside on Broad Street. The building will have one bedroom units of 560 square feet and two bedroom units of 867 square feet. There will be ten units per floor and the fifth and sixth floors would have balconies. There will be a common roof deck on top. 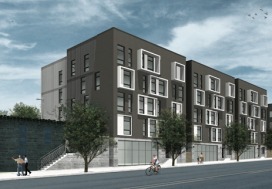 The façade will be made up of stone, red brick, and black metal panels, with black windows. There will be metal screening along the parking section, along Alter Street. The developers will add new street trees on both Broad and Alter Streets. 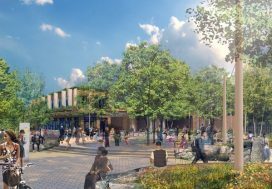 This new development has the support of the South Broad Street Neighborhood Association and has recently been approved by the City Planning Commission, after having been reviewed by the Planning Commission’s Civic Design Review board. The development conforms to zoning for the site, so the developers do not need to seek a variance and can begin very soon, since they have already demolished the garage on the site.